Puri - Lord Jagannath's land - Ghumakkar - Inspiring travel experiences. As the year end was approaching, and we didn’t have any plans for new year. On Dec 19 my husband called us and asked us to fly down to Kolkata where he is currently on deputation so that we can utilize our son’s Christmas Vacation and also will get a chance to see Kolkata together. 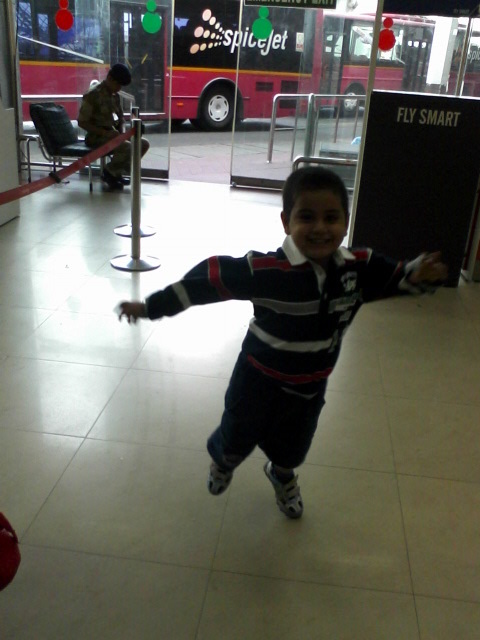 My son was very excited as he was going to meet his dad after one month. In Hurry burry I packed our bags and left Chennai on Dec 21, 2012 for Kolkata. Luckily on Dec 20, 2012 we tried tatkal tickets for Puri sitting at home and we were fortunate to got Tatkal tickets available for next day Doronto train to Puri. So on Dec 21, 2012 We quickly got ready as train to Puri was at 2000 hrs. 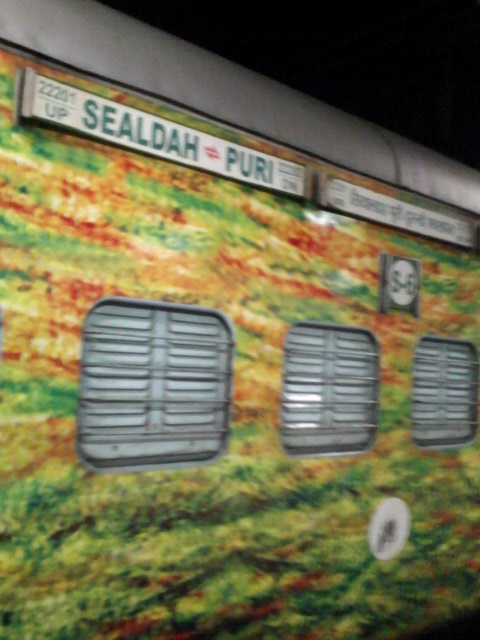 We boarded the Sealdah –Puri Doronto from Kolkata- Sealdah station. The best thing about this train is that, we can reach Puri in this train in just 08 hrs nonstop from Kolkata , also it gives us complete day to enjoy and explore Puri. 2000 Hrs – We boarded the Doronto train (This Doronto train has both 3AC and Sleeper class) from Sealdah Station . The train coach was new, clean and full of passengers travelling to Puri only for Shri Jagannath darshan. At around 2100 hrs we got our Dinner in the train and we all slept at 2200 hrs so that one can easily get up in the morning as the arrival time of train at Puri was 0400 hrs. 0400 hrs – Train reached Puri at 0340 hrs only i.e before time and Coolie came inside to wake everyone up. We got down at station. It was little cold. The temperature displaying at the station was 16 degree. Around 0415 hrs we came out of station and gave call to Dipa Da (Son of one of the Jagannath temple Panda).He was referred by a friend of us as a “All in one , complete resourceful person” in Puri. He told us to wait outside station and within 15 minutes he came to pick us. That’s what we called service. If someone is coming to pick you at a strange place early morning,then I would not hesitate to even pay whatever his service charges for doing all this help. We were told that he will take you to the different hotels, whichever you like or prefer or whichever Hotel comes under your budget, you can book. We then took the Auto and was following Dipa Da’s bike. He first took us to the Hotel “Sonali” right opposite the Swargdwar (Puri beach), but unfortunately the hotel was full. We also searched few more hotels near to beach but due to weekend all hotel s were booked. At the end we found a room in a Hotel called “OM Hotel”. We paid Rs 100/- to the Auto person. Dipa da left us at the Hotel and asked us to meet him outside the Temple at South gate at 0630 hrs. 0500 Hrs – At 0500 Hrs we entered into the Hotel. This hotel is also sea facing, but we didn’t get the sea facing room. The room was small in size, reasonably good, clean, air cooled with attached toilet but without Geyser and also without room service facility. We took rest for 15-20 minutes. Then we asked one of the staff at the hotel if he can arrange a cup of tea for us. He said that tea and even Hot water can also be arranged but on payment basis. He charged us Rs 5/- for tea and Rs 10/- for a hot water bucket which was quite reasonable. We got ready by 0615 and left for temple again by Auto and charged us Rs 80/- (Charges were informed to us before only, thus no cheating business or overcharging). We were very much worried about how we will do the darshan with our son who is just four years old. Whether we/he will be able to manage in the crowd? We thought of doing Darshan at closing time of temple when we will get less crowd but God has some other plans for us. 0630 Hrs – We were greeted by Dipa da at the south gate of temple and he was in a different attire i.e. Panda’s attire and we were shocked to see him as morning he was looking like a smart modern young generation guy and in two hours complete makeover. Good to see him. He asked us to deposit our cell phone, cameras and footwear in a nearby shop. The Shop person charged us Rs 2/- for each pair of footwear and Rs 5/- for each mobile or camera. He asked us to wash our hands and legs and then we entered inside the temple..The dada asked us to pay him Rs 50/- for buying ticket for both of us. There was a long queue and we were bit confused how we will manage to enter in this long queue. There was also rush of Pandas outside the ticket counter. At around 0730 hrs he brought the ticket and asked us to follow him. 0730 Hrs – We had entered the huge temple. Dipa Da was very nicely protecting us as well as our kid and also another group with an old lady from the crowd and took us near the main Garbh Grah of temple. OMG, Lord Jagannath, Balram ji and Subhadra ji was right in front of us. The idols were huge with height approximately around 2.5 to 3m and one can see the idols from the distance as well. The deities of Jagannath, Balabhadra, Subhadra are made from sacred Neem logs known as Daru Bramha. Depending on the season the deities are adorned in different garbs and jewels. So as we went during winter and that too on Saturday the God was dressed in Black with white piping Sweater and a cute same coloured cap. I was so happy to See Lord Jagannath and that too in such a cute dress. I was actually imagining them as a small baby wearing such a cute woollen cap. So By God grace we got this wonderful darshan, we touched the idols and returned outside the temple by 0830 hrs safely without getting hassled due to crowd. The main temple is a curvilinear temple and crowning the top is the ‘srichakra’ (A eight spoked wheel) of Vishnu. Also known as the “Nilachakra”, it is made out of Ashtadhatu and is considered sacrosanct. 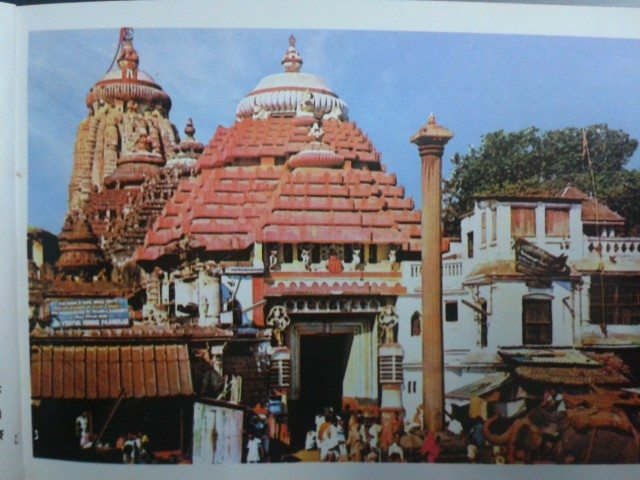 Among the existing temples in Orissa, the temple of Shri Jagannath is the highest. The temple tower was built on a raised platform of stone and, rising to 214 feet (65 m) above the inner sanctum where the deities reside, dominates the surrounding landscape. The pyramidal roofs of the surrounding temples and adjoining halls, or mandapas, rise in steps toward the tower like a ridge of mountain peaks.The temple has four entrances. The one on the east side is known as (Singahdwara) Lion Gate. The Singahdwara, which in Sanskrit means The Lion Gate, is one of the four gates to the temple and forms the Main entrance. The Singhadwara is so named because two huge statues of crouching lions exist on either side of the entrance. 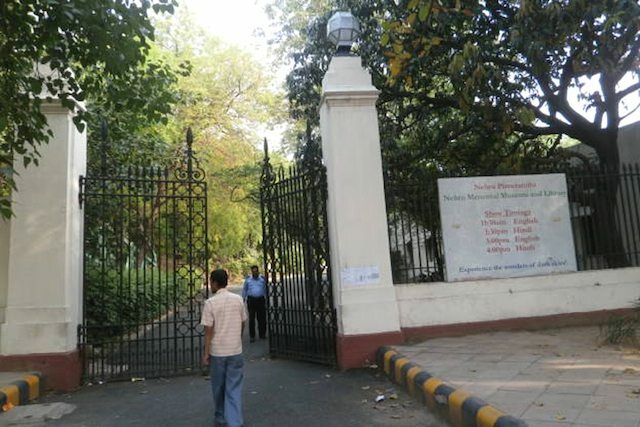 The gate faces east opening on to the Bada Danda or the Grand Road. The Baisi Pahacha or the flight of twenty two steps leads into the temple complex. Apart from the Singhadwara, which is the main entrance to the temple, there are three other entrances facing north, south and west. They are named after the sculptures of animals guarding them. The other entrances are the Hathidwara or the Elephant Gate, the Vyaghradwara or the Tiger Gate and the Ashwadwara or the Horse Gate. Thus finishes our Darshan at 0900 hrs and we were out and we had full day with us to explore Puri and around areas. We came back to our Hotel and got ready to explore Bhubaneshwar and Konark. Main cover page of picture book purchased. 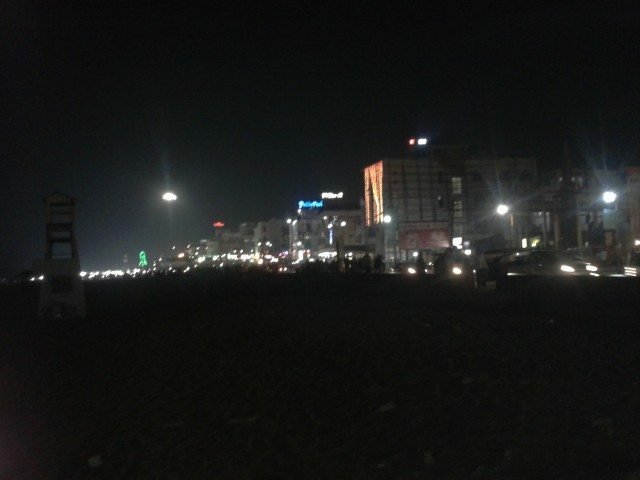 1800 Hrs – In the evening we came out of the Hotel to explore Puri Market and Swargdwar. As regards to Puri Beach I have always seen in television that sand art is generally performed at Puri Beach so I was looking at the beach if I can found any sand art. 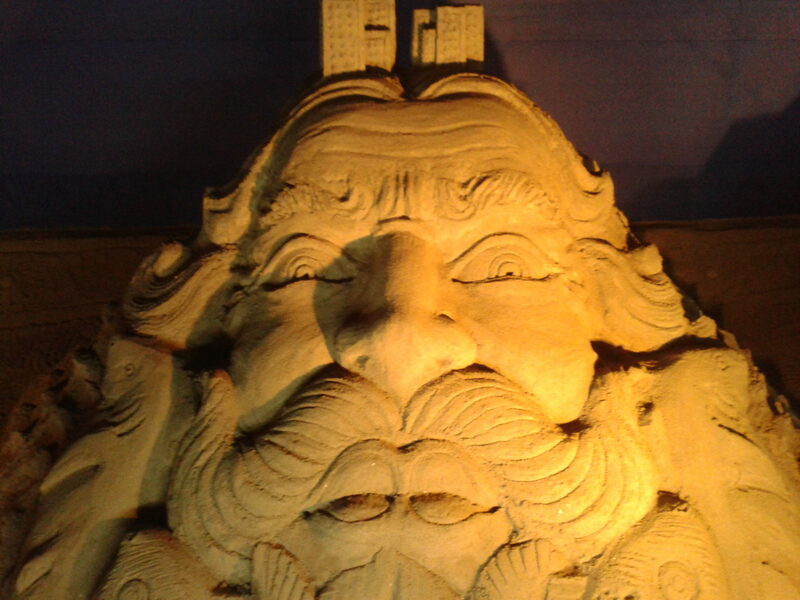 Unfortunately we did not get to see any sand art on Puri beach. 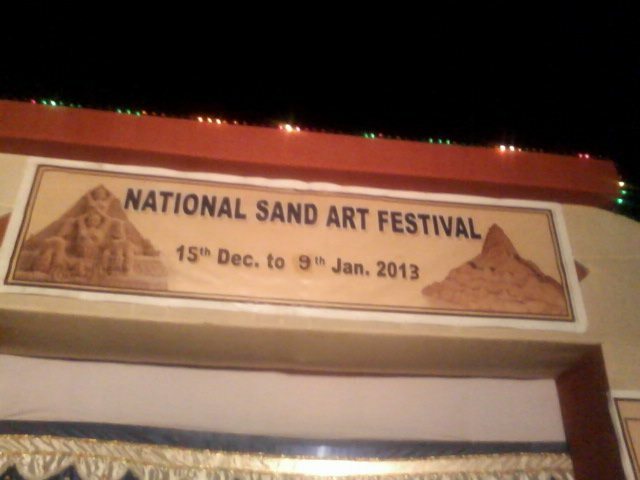 We were walking on the beach and there I saw a board “National Sand Art Festival”. We were so excited and quickly took tickets (Rs 20/- for each person and Rs 15/- for camera).We entered inside and got to see some beautiful art works. This finishes our Puri darshan and we were ready to catch our train next day morning at 0615 hrs for Kolkata. Journey to Bhubaneshwar and Konark continues in next post. Abhi .. it is a good post. The photos of sand art are mind blowing. I can guess, these would be many folds more beautiful than they look in fotos. ???? ?? ???? ?? ??? ?? ??????? ????? ???? ???? ??? Very nice writing and detailed informaiton good photos. Lord Jagannath is popular in whole world and Rath Yatra celebrated in India and Aboroad. Your son so cute. Thanks a lot share wonderful journey with us. Only yesterday, a friend of mine (Retd. HOD, Arts and Paintings Dept. of a Degree College who is a good photographer also) came to my bank to show me the pics he had recently taken in his tour of Konark Sun Temple and Bhuvaneshwar etc. On my laptop I saw hundreds of great pics which he had taken. With those pics still fresh in my memory, I was able to enjoy your post much more. Your pics of sand painting are also impressive. Thank you for sharing your travel experiences. Excellent account of your visit to Puri, Abhee. I was hoping that you would mention about the remuneration charged byDipaDa for his services and his contact details. It would have been immensely useful for others planning a visit to Puri. 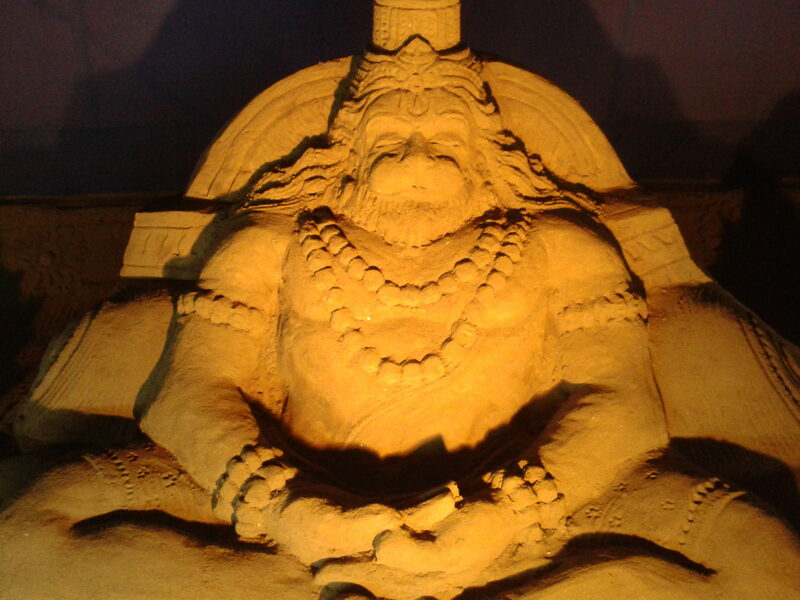 The sand sculptures are absolutely fantastic, especially the one of a meditating Hanumanji, which has a very spiritual feel to it. I wonder if they are by the celebrated sculptor Sudarshan Patnaik or any of his disciples. Looking forward to your account of the other places you visited during your Odisha trip. Thanks DL sir for liking it. Actually I wanted to share the charges details,but then thought It would look like as if I am advertising him,that’s why Didn’t mention. Although, I have all details which any person visiting can take from me. I am not sure who were the artists as their names were not displayed. Again thanks for your feedback…Comments from everyone always gives encouragement to me. Wow! So you made it to Puri. I love Puri and everybody loves Puri. Yes Praveen ji, at last I made it. you were very correct, there are so many hotels on swargdwar road and on temple road. Thanks for providing information regarding flag changing. For everyone in Kolkata/WB, if we have two to three days holidays ‘let’s go to Puri and we haven’t visited the place since 2002. It’s been long time and our plan to visit Puri postponed every year. I want to be a part of the crowd during Ratha Yatra festival, definitely sometime in my life. 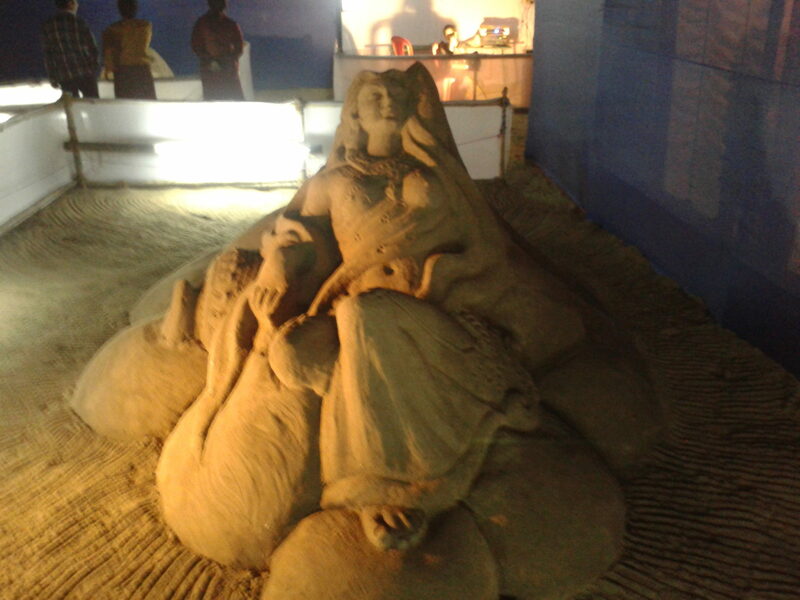 Photos are great…all thanks to the efforts of the renowned Sand artist Sudarsan Pattanik. This has become world famous. Look forward to your next posts. Thanks Amitava for liking it.Do plan your visit , for you it is so near to Kolkata. Puri evokes nostalgia and enjoyed reading your post on this place. Your typically elaborate descriptions make the posts full of information and worthwhile read for would-be visitors (not to mention the readers who are offered almost a virtual tourism). Dipa da seems to be a resourceful person. I would say that there is no harm in publishing contact no/details of such persons whom you feel to be genuinely helpful so that others can take his benefits too. Don’t think that such inputs from Ghumakkars will be thought of as advertising attempt. And what about the famous Khaja of Puri? Aapne khaya to hoga……? Thanks Auro for liking and appreciation. Ha,humne Khaja bhi khaaya aur malpua & rabdi bhi.I really liked Rabdi with rosogulla or type of it dipped in it. An interesting post with beautiful pictures. Thanks a lot Mukesh ji. Nice post with interesting pictures. Did you get to have “Dalma”? A very interesting Kalinga dish. ???? ?????? ?? ????? ??? ,??????? ?????? ?? ????? ???? ?? 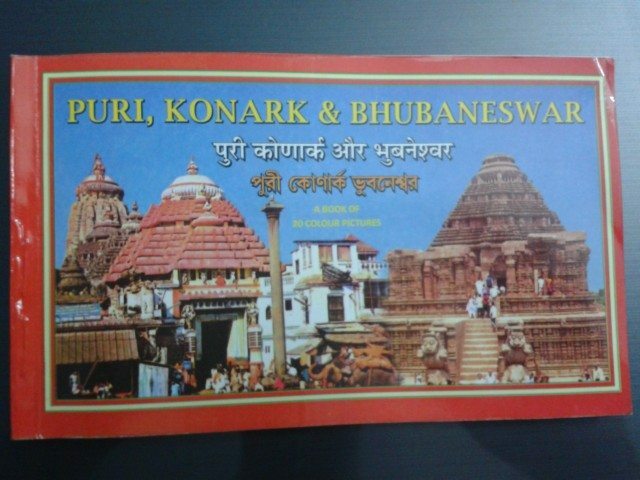 Hum log puri ke aage Bhubaneshwar aur Konark bhi gaye the.Uske details maine next post me likhe hai. Wahe ke mandir bhi acche lage. Very nice & full of information post along with good pics. Specially sand art. Once time i have been here. Very nice and b’ful place. 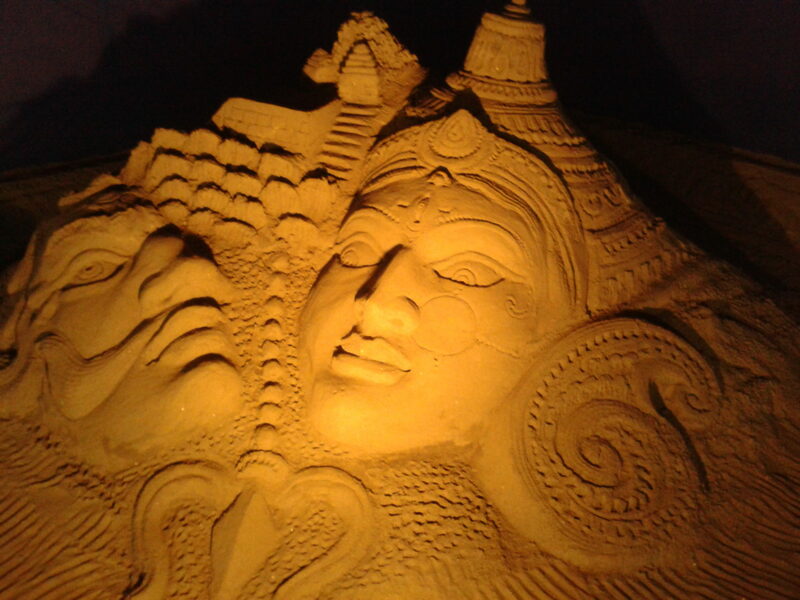 Yes… Puri beach one of the famous beach of india for sand art & sea bath. Thanks a lot Ritesh ji. 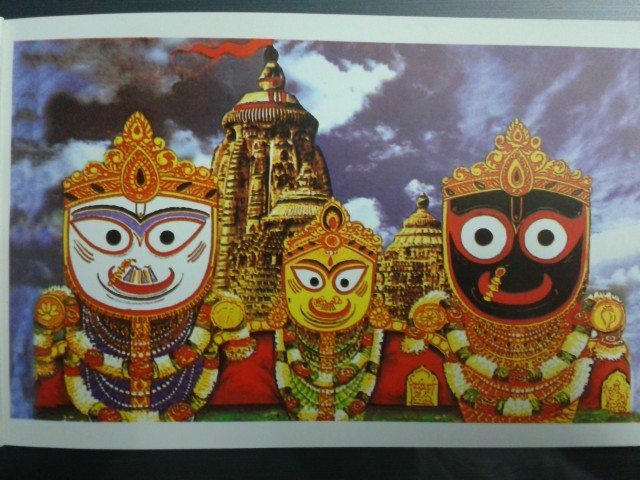 Puri is one of the destinations where Lord has not yet called in this life . I would love to visit this temple and this Dham. It is one of the post which will greatly help me in near future. Sorry what favors did you give to Dipa Da for his help? Also did you visit Adi Shankarcharya Math there or Know anything about it? As regards to Dipa da. charges, there was some miscommunication happened between me and my friend who referred me about Dipa da.My friend told me that overall expense at the temple would be around 1000/- rs.So we paid Rs 1100/- to Dipa da. And he was very happy when we paid him this amount. So I got confused and I later cross checked with my friend . He told me that expense includes Anna daan amount as well. SO from our end nothing goes to Anna Daan,everything went to Dipa da. But this was GOD’s wish so we didn’t think too much.So if at all you are going please take as per your decision and negotiate accordingly. Actually for us GOD has compensated the amount we had given. This is my belief but still I want to share my experience. Our return ticket was also in Doronto and when I was booking ticket as usual I booked two tickets ,for me and for my husband as my son is 4 years old.When we were in Puri , in the evening I realised that the train is seating CC train and it would be difficult to adjust our son (by that time even chart got prepared) So we thought we will ask TC, if we can adjust one seat for us in case it is empty.When we entered in the train we saw two seats 69 and 70 was not mentioned in the chart and our seat number was 67 and 68 that means without asking TC we got seat to sit.When TC came , we asked him how much to pay for kid as we forgot ,he said that’s ok. These seats are staff seat and you can use till the time staff are serving food.So we didn’t pay money for seat aur end tak koi bhi staff waha baithane ke liye nahi aaya.The ticket cost for one seat in this train was Rs 700/- which means humne jo 1100/- bhagwaan ke liye diye usme se bhagwaan ne humein 700/- lauta diye. Ye mera belief hai. Great hour-by-hour account of the whole thing. I like these more then the larger-than-life texts :-). These seem much more honest. Some more details about the temple would further help. Also it seems that one can not take cameras inside. I was also curious to know more about Deep Da’s charges but I would write to you when we do make a trip. If not the actual and accurate charges, a hint of it would certainly help Ghumakkars. Please also write a few lines about the hotel and any pics if you have clicked. This would further help readers. Thanks for liking and appreciating. Infact I generally do not like what I write as I am not very good in writing as well as in English or Hindi, still,thanks for appreciation.Sorry,if details about temple is less, will try to improve these things in future. Yes, cameras,mobile phones are not allowed inside the temple and everyone is thoroughly checked. Although Pandas are allowed to take cell phones inside as I saw many pandas using it.Not sure it is officially allowed or not. As regards to Dipa da. charges, there was some miscommunication happened between me and my friend who referred me about Dipa da.My friend told me that overall expense at the temple would be around 1000/- rs.So we paid Rs 1100/- to Dipa da. And he was very happy when we paid him this amount. So I got confused and I later cross checked with my friend . He told me that expense includes Anna daan amount as well. SO from our end nothing goes to Anna Daan,everything went to Dipa da. But this was GOD�s wish so we didn�t think too much.So if at all you are going please take as per your decision and negotiate accordingly. We paid Rs 800/- for Hotel charges which I think was in higher side , we could have got this hotel in Rs 500/- only.But searching Hotel early morning was for us a difficult task.So we were satisfied with it. Our room was may 8′ x 8′ congested small room with LCD tv and fan and tubelight. Attached EWC toilet with one tap just for cold water and wash basin. I would suggest a hotel name “Seagull”, very nice hotel but late room service . 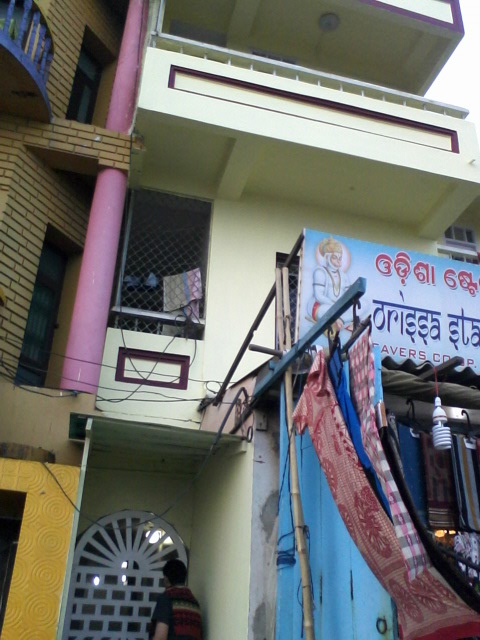 This hotel was used by my friend when they visited Puri. This Hotel has non ac room for Rs 680/-.This can be booked online as well. There are accommodations from Temple side also.For that one can check temple website or may call to Dipa da, he will arrange.But I must Puri is full if Hotel , but less online booking facility and more walk in booking preferred. There are many hotel right in front of Sea beach and rooms are there with open verandah that means very much safe. We were there for just a day and we had covered maximum of all three places i.e puri,bhubaneshwar and Konark. While the sand art pics are really great as everyone has mentioned about them, your post is motivating me to visit this place but the problem with me is : we can go once in a year only as a family and that too in March end. If travelling alone, I can go anytime anywhere. Why don’t you like your way of writing? In your case, it seems coming straight from your heart, which draws everyone towards your posts. Please keep writing and keep sharing. Thank you Sushant ji for encouragement and liking the post. Please do visit Puri, it is really a very holy place with positive vibrations.If you really have plan to visit in March then give call to Dipa da sometimes in the month of Feb. I hope he will arrange a very nice trip for you. Finally read your post and liked it. Good going. Thanks Abhisek. The credit of this trip goes to you only…Thanks again. Very nice post Abheeruchi. I have been to Puri countless times. Almost every year we make it a point to spent 3-4days there. It is a lovely place to be. I especially love bathing in the sea waves as the sea current is very stong in Puri. There is a particular beach near puri named Chandrabhaga Beach which is truely beautiful. I will try to put up a blog on it next time I go there. Thanks for reading post.You are very fortunate that you have visited Puri many times. 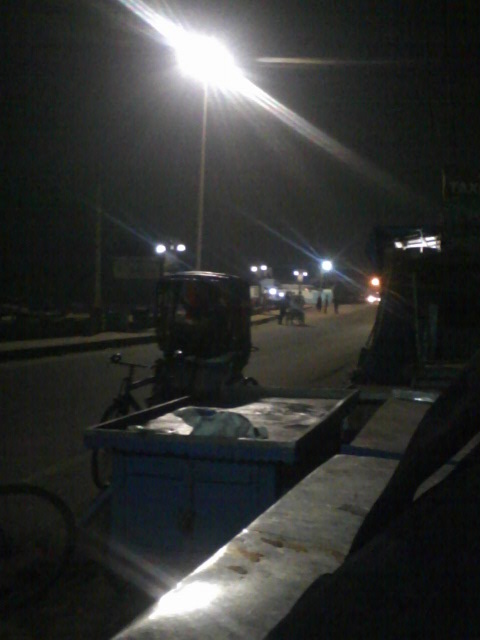 Puri is really very nice place.We had been to Chandrabagha beach and I had mentioned about it in my Konark post http://www.ghumakkar.com/2013/01/25/konark/. I would like to read your experience as well. तारामंडल के बीचो-बीच एक विशेष प्रकार के प्रोजेक्टर ने धीरे-धीरे क्रियाशील होकर गोलाकार छत रुपी परदे को अपने प्रकाश से ढक दिया. आकाशगंगा, तारामंडल, ग्रह-नक्षत्र आदि ब्रह्मांडीय आकृतियों ने प्रकट होकर तारामंडल की छत को वास्तविक आकाश के रूप में परिवर्तित कर दिया. ब्रह्मांडीय खगोल की क्रियाओं जैसे ब्रह्माण्ड की उत्पत्ति, तारों के बनने नष्ट होने की प्रक्रिया, आकाशगंगा का बनना, ग्रह नक्षत्र, सौर परिवार के ग्रहों के आपसी सम्बन्ध और उनकी गति, भ्रमण, परिक्रमा आदि अनेक जानकारियों को बिखेरता हुआ तारामंडल का शो प्रगति पर था. ब्रह्माण्ड के नक्षत्र, आकाशगंगा, सौर परिवार और ग्रहों आदि को अच्छी प्रकार से समझने हेतु तारामंडल विशेष उपयोगी है.